This kid approved recipe has no added sugar and no grains. 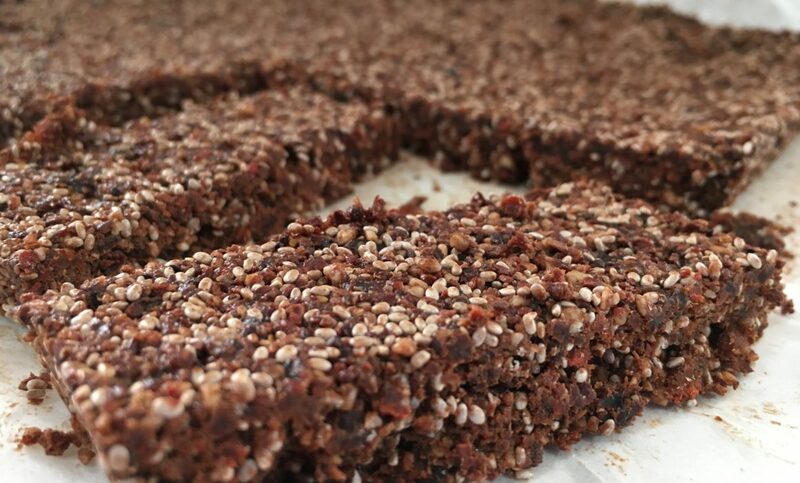 It is full of superfood ingredients like goji berries, chia seeds and cacao to fuel your child! It is also super easy to make! It has a much more ‘tart’ flavour than many fruit snacks. If you think it won’t be sweet enough for your child, you can swap some of the cherries for medjool dates. I like to keep a lot of diversity in the flavours I give my children, so I like the tartness. Add all the ingredients to a high speed food processor and mix on high for about 10 seconds, until the ingredients come together like a dough. Pour the mixture into a deep baking tray (I used a 23cm x 23cm x 4cm). Cut into appropriate size pieces for your children.